Aug. 22, 2018 | 1 p.m.
Lancaster (at lower right) is the seat of Grant County, where land sales are relatively higher compared to the rest of Wisconsin. For land-owning farmers facing tough economic circumstances, the decision to forgo another year's crop or to liquidate their livestock is not an easy one. Some may choose to retire from farming, selling their equipment and land. Others, however, pursue a somewhat different route, renting out their property with an eye towards a brighter financial future. "The commodity prices are such that several people have decided to discontinue their livestock operations, but that doesn't mean they move into town," said Arlin Brannstrom, faculty associate at the University of Wisconsin Center for Dairy Profitability. "They still live on the farmstead, and they'll either rent to a neighbor or find someone else who might be able to farm their land for them." The cost of agricultural land in Wisconsin has remained fairly steady in the 2010s, according to a February 2018 report by Brannstrom, published by Center. 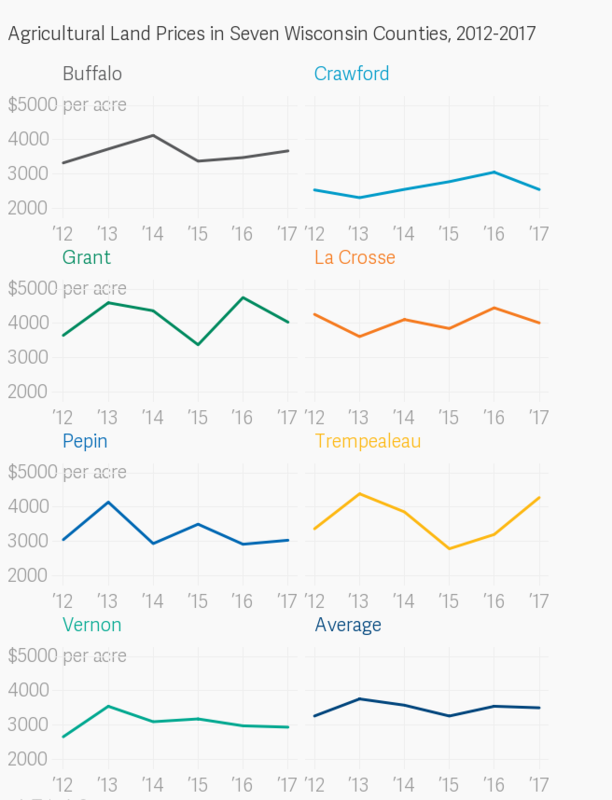 In seven of the state's eight counties fronting the Mississippi River — Pepin, Buffalo, Trempealeau, La Crosse, Vernon, Crawford and Grant — land sales were relatively high compared to the rest of the state. 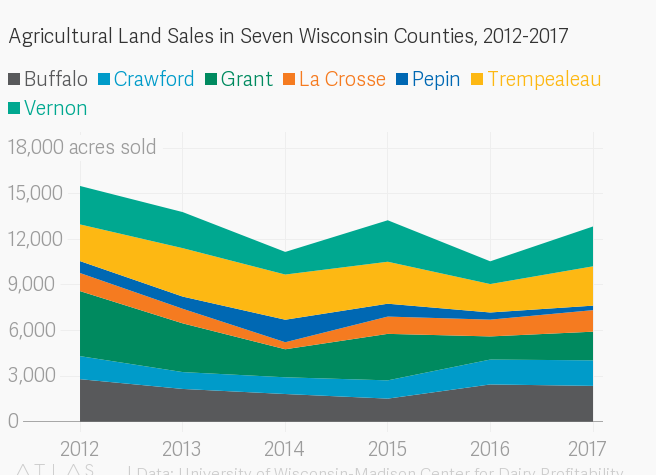 In 2017, there were 231 agricultural land sales in a collection of counties that included Pepin, Buffalo, La Crosse and Vernon, while there were 167 sales in an adjacent district including the other three counties. From 2012 to 2017, these areas had the highest number of agricultural land sales than the other statistical districts in the state. While land sales are relatively brisk in this region of Wisconsin, the rental strategy is robust as well. Brannstrom noted that the demand for rented farmland is high, and in fact more acres are rented than sold each year in the state. Why are farmers choosing the rental route? For starters, according to an August 2018 report released by the U.S. Department of Agriculture's National Agricultural Statistics Service, Wisconsin's agricultural land values have been generally increasing in all three of its reporting categories between 2009 and 2017: cropland, pasture and farm real estate. This increase means many farmers could make a profit by renting their land, especially if they are not farming it. That's because farm production expenditures are also up, as detailed in another August 2018 report from the USDA. In fact, from 2016 to 2017, total farm expenditures rose six percent, in categories like feed, fuel, construction and machinery, among others. Brannstrom points to advantages of flexibility with renting farmland. In his report on agricultural land values, Brannstrom wrote how narrowing profitability for many Wisconsin farmers has caused an increased use of flex leases, which allow landowners and tenants to share the risks and rewards of the agreement. But farmers can also lease buildings and livestock facilities, equipment, beef cows and pastures, giving them more flexibility and options as to which route to choose. Brannstrom noted that many rental agreements can be fairly informal, especially for older farmers who might not want to actively farm on their land, but don't want to sell it either. "Especially in the last ten years or so, land prices have increased, because in the early part of the decade, commodity prices were so high," Brannstrom said. "But land prices have remained high because there's no other alternative investment source that would combine the possibility of asset appreciation and some steady income." For those farmers who choose to sell their land, they receive more instant and greater financial benefits than renting would allow. However, they lose all connections and involvement to their livelihood – and many such farms have been in the same family for generations. As Brannstrom note in his report, rising land values are a "mixed blessing" for established farmers and their families. "The appreciation in land value is only realized when the assets are sold," he wrote. "In most cases, the ongoing business is neither directly responsible for nor directly benefited by changes in land values. High land values provide the retirement cushion for 'last generation' farm businesses." Julie Grace was an intern with WisContext in the summer of 2018 and worked with Wisconsin Public Television through the O'Brien Fellowship in Public Service Journalism at Marquette University.